Nabil Sadoun made his views about the Israeli-Palestinian conflict clear during a 1993 interview. Asked about conflict with "the Jews," Sadoun described it as "the first priority for Muslim[s] until the Holy Land is liberated and the backbone of the Jews is broken." He invoked verse 5:82 of the Quran, calling it "God Almighty's most accurate description of" Jews: "Strongest among men in enmity to the believers wilt thou find the Jews and Pagans." Several things were required to liberate Palestine, Sadoun said, including, "Raising the spirit of Jihad and struggle amidst the Palestinian people and the Muslim peoples," and unifying Muslim nations "to form a tight Islamic front to face the Zionist Existence and put an end to it." All Muslims have a duty to break the Jews' backbone, Sadoun said. "For this reason if we want to work for this cause in an Islamic and systematic fashion, it is a must that Muslims of all backgrounds participate in the various areas and fields of administrative, political, media and Jihadi work." The interview was with Al-Amal, published at the time by the Muslim Arab Youth Association (MAYA), which was founded by Sadoun in 1989. MAYA had ties to the Muslim Brotherhood and Hamas, federal investigators say, an assessment based in part on the accounts of a former MAYA activist. The organization "served as a conduit for money to HAMAS, through the [Holy Land Foundation], and served as a forum where HAMAS could promote its ideology and recruit new members," an FBI statement filed in Sadoun's deportation case said. MAYA also worked closely with other Islamist groups, including the Islamic Association for Palestine (IAP). That's where the Council on American-Islamic Relations' (CAIR) co-founders worked in 1993. Sadoun's comments in the Al-Amal interview likely were well read in those circles. Despite Sadoun's openly published radical comments, CAIR's leaders placed him on their national board of directors, a position he held until just before his 2010 deportation. On immigration papers, he listed 1996 as his first year with CAIR. He was CAIR's national vice chairman the year before he left. But he did not mention MAYA or the United Association for Studies and Research (UASR), a think-tank created by a senior Hamas official, on those immigration forms. He did include his AAA membership. According to information in his deportation case file, obtained by the Investigative Project on Terrorism via a Freedom of Information Act request, Sadoun was an influential player in a number of American Hamas-support efforts. MAYA, the organization he ran, "served as a conduit for money to HAMAS ... and served as a forum where HAMAS could promote its ideology and recruit new members," the 2010 FBI declaration said. In videos, Sadoun is seen at MAYA conferences with Mousa Abu Marzook – a veteran Hamas political leader who helped establish many of the Muslim Brotherhood's Hamas-support structure in the United States before being deported in 2010. Hamas leader Khaled Meshaal was a keynote speaker at MAYA's 1992 conference, the FBI statement said. Mohamed Shorbagi, a Georgia imam who pleaded guilty to Hamas support and cooperated with federal investigators, said Meshaal also spoke in a closed-door session of the Palestine Committee, a network of U.S. Islamist groups charged with supporting Hamas politically and financially. At that 1992 conference, Sadoun gave a speech that was "immediately followed by a video about HAMAS and requests ... for monetary donations that would go to HAMAS," the FBI declaration said. Sadoun made multiple donations to the Holy Land Foundation (HLF): "As a high ranking member of the US-MB [Muslim Brotherhood] and a member of PALCOM [the Palestine Committee], SADOUN would have knowledge of HLF's role as HAMAS's financial arm in the United States," the FBI declaration said. Sadoun is included on an internal telephone list of Palestine Committee members recovered by the FBI. He served as a religious authority for the committee, Shorbagi told authorities. Phone records show Sadoun made "numerous calls to the personal home telephone number registered to Khalid Mishal, the current world leader of HAMAS," the declaration said. Those records show a dozen calls between Sadoun and Mishal [also spelled Meshaal] in 1993-94. Other Palestine Committee members include two other top CAIR officials, co-founder and former national board Chairman Omar Ahmad (appearing as Omar Yehya) and co-founder Nihad Awad – the only executive director in CAIR's 21-year history. CAIR itself is included among the Palestine Committee's branches in a 1994 meeting agenda of the Hamas-support network. 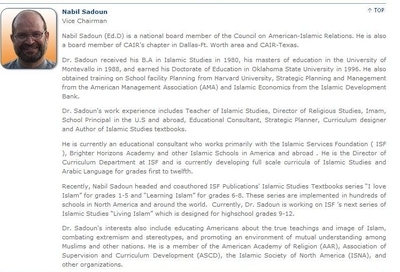 For more disclosures about CAIR in the Sadoun files obtained by the IPT, click here. Sadoun spoke with Immigration and Customs Enforcement officials in 2003 and to the FBI in 2006, denying he was a Muslim Brotherhood member and claiming he had no knowledge that he was listed as a UASR director in corporate records. Records obtained by the FBI, however, identify Sadoun as "an elected member of the Muslim Brotherhood's Plains region." He acknowledged that Hamas speakers participated in MAYA conferences during his tenure and Hamas was promoted. This occurred before support for Hamas became illegal in 1995 under an executive order signed by President Bill Clinton. The Hamas presentations were allowed, Sadoun told investigators, because "he had to be polite to all guest speakers and that it was his responsibility to offer guest speakers who would discuss 'hot topics.'" But Sadoun's acknowledgement that he invited Hamas speakers and his multiple connections to a Muslim Brotherhood orchestrated Hamas-support network are far removed from the image Sadoun offered the public. 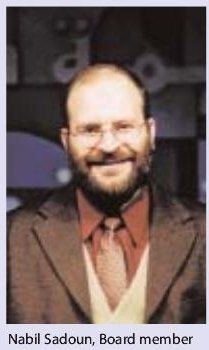 His CAIR biography emphasizes a commitment to "educating Americans about the true teachings and image of Islam, [and] combating extremism and stereotypes." 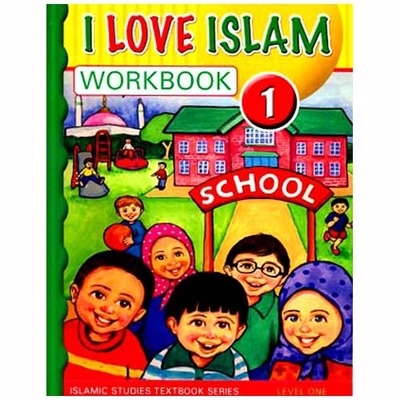 He coauthored a series of textbooks for elementary and middle school children with titles "I Love Islam" and "Learning Islam." The books remain available for sale on Amazon.com and other outlets. Sadoun was ordered removed from the United States by the Immigration Court after being found deportable under a 21-count charging document for lying to immigration authorities about his connections to Muslim Brotherhood and Hamas-linked organizations. Obfuscation, deception and deceit as it related to the Muslim Brotherhood, Hamas and support organizations, including CAIR, was proven in the Sadoun immigration case, as it was in the HLF prosecution. The officials who founded and ran those organizations are no strangers to engaging in such deception and deceit, particularly when it comes to furthering their goals. The case of Nabil Sadoun has brought those lies to the light of day.